Dr Anil Abraham, a well known dermatologist and trichologist, and Professor & Head of Dermatology - St. John's Medical College in Bangalore, answers some common questions on hair health. Wellness Team – Nowadays, many young professionals complain of hair loss / hair fall. Isn't hair-fall a natural phenomenon? At what stage of hair loss should one start to worry and consult a professional dermatologist or trichologist? Anil Abraham - A little hair-fall is natural. The normal number often quoted is hundred hair strands per day. Most people lose about five to ten hair per day. If it seems more than your normal loss and is worrying you, consult with your doctor. WT - Is dandruff a perennial problem? What is the cause and what is the best remedy? AA - Dandruff is the shedding of skin cells on the scalp. If it is infected with fungus it could cause itching and excessive scaling. It can be recurrent for some people, either as dry or oily scales. It can be treated with medicines and appropriate washes. Like how a toothpaste is used every day, a mild medicated shampoo may be used once a week or once in two weeks to keep the scalp clear. WT - There are several ‘remedies' that are passed around amongst friends and colleagues, to prevent excessive hair loss and dandruff. Some examples - curd, methi paste, egg. Do they really work? If not, can they cause harm to the hair roots or strands? 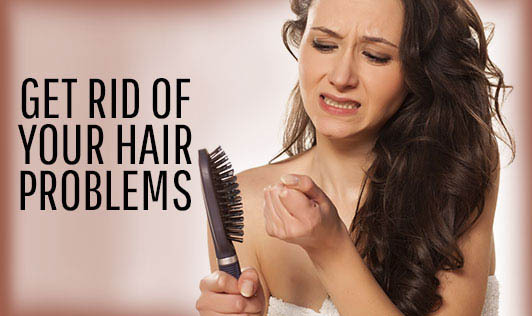 AA - Home remedies do have some basis and role in normal hair care. But once there is significant hair loss or dandruff, keep the curd for the curd rice, the egg for an omlette, and make a beeline for a qualified doctor. WT - Premature graying is a common sight in young adults in their thirties or perhaps even twenties. Is this a result of lifestyle changes or does heredity have a role to play? AA - Both. Some families do have early graying called premature canities. But increasingly, nowadays lifestyle is the major villain with poor eating and environmental pollution featuring as Mogambo and Gabbar Singh. WT - Apart from improvement in blood circulation and benefit of relaxation, how does oil massage on the scalp help? AA - The oil can be an external pre-bath conditioner. Some oils help for a dry itchy scalp. Otherwise, it mainly relaxes the person and helps to improve circulation. WT - Can using a hair dryer cause dry and brittle hair? AA - Brief answer...Yes! Just by thermal damage when used in the hot mode and close to the hair. WT - Do shampoos, hair colors, hair styling with electrical gadgets, hair creams, etc affect hair health in any manner? AA - Most of these damage the cuticle which protects the individual hair shaft and cause physical damage to the hairs and their roots. WT - Does wearing a helmet cause hair loss? AA - An emphatic NO!! Helmets protect your hair from environmental damage and help the hair and the head. Use a cotton bandana if you want to prevent discomfort and excessive heat. WT - Your thoughts on hair transplant. AA - Hair transplant is an increasingly common solution to significant hair loss and balding. Camouflage is also available as hair dusting powders that give a good coverage for an event. Hair transplants are simpler and with better results than most people think. WT - Anything else you would like to add in response to the growing number of hair concerns faced by computer professionals? AA - Good hair is a reflection of good health. Correct nutrition, regular exercise, adequate sleep and busting stress will help in keeping the hair on your head intact.